Putting Art on the Map at the BPMA: Queen Mary’s Army Auxiliary Corps Signallers, Base Hill, Rouen. Telephones. Forewoman Milnes and Captain Pope. On Monday 10 February 2014, I attended the Historypin and Putting Art on the Map event at the British Postal Museum and Archive at Mount Pleasant in London. The aim of the event was to “crowdsource” expertise and knowledge in order to improve catalogue information about First World War art held by the Imperial War Museum, London. The particular theme of the event was Postal communications and Telecommunications in the First World War and further information about the event is available on the HistoryPin blog as well as the British Postal Museum & Archive blog. All of the participants were given physical and online copies of a selection of art relating to World War One telecommunication and postal communications from the IWM collection and asked to discuss and contribute further details. While it was possible to contribute research and knowledge to multiple images (and this was something which happened more in the discussion at the tail end of the event), I choose to research a single image: Queen Mary’s Army Auxiliary Corps Signallers, Base Hill, Rouen : Telephones. Forewoman Milnes and Captain Pope. Queen Mary’s Army Auxiliary Corps Signallers, Base Hill, Rouen : Telephones. Forewoman Milnes and Captain Pope. Art.IWM ART 2900. Copyright IWM. 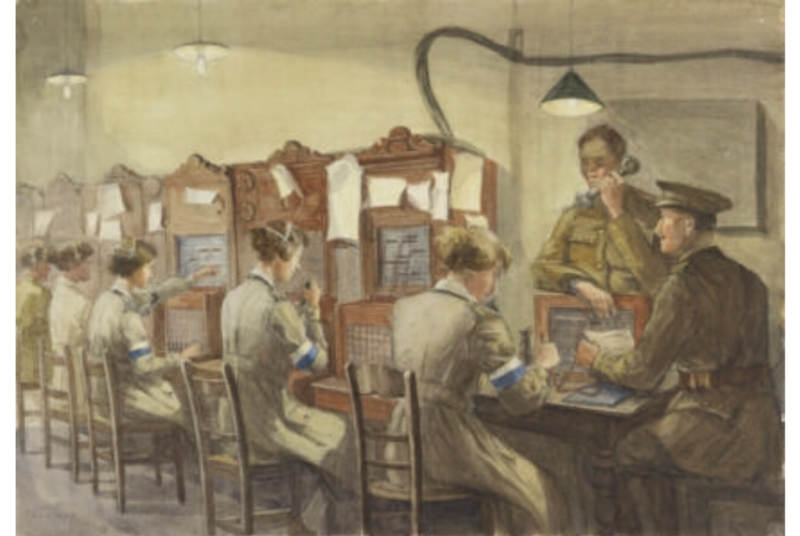 The existing information in the catalogue was the title (above); the name of the painter, Beatrice Lithiby (OBE); and the description: view of a military telephone exchange, with four women operators seated at their telephone sets, a seated male officer and a soldier using a handset. Rouen was one of the major Infantry Base Depots (IBD) and was in use for the duration of the war. Rouen in particular was a supply base and also home to a number of hospitals. As a result, it is home to a number of World War One cemeteries for the soldiers who died at the nearby hospitals. An IBD was one of the British Army holding camps which were situated within easy distance of one the Channel ports. IBDs received men on arrival from England and kept them in training while they awaiting posting to a unit at the front; they were also used supply bases. Source: The Long, Long Tail: The British Army in the Great War of 1914-1918 – The Infantry Base Depots. Information about Rouen base is available via the War Diaries held by the National Archives, in particular WO 95/4043 – Rouen Base: Commandant, August 1914 to December 1918. Unfortunately, none of these diaries have been digitised as of now (February 2014) in the National Archives Unit War Diaries. Update from David Underdown at National Archives: At present [February 2014] only war diaries of divisions and subordinate formations have been digitised. GHQ, Army, Corps and Lines of Communication units have not yet been done (and nothing outside France and Flanders). Next, I moved onto information about the artist, Beatrice Ethel Lithiby. Beatrice Ethel Lithiby (1889-1966) Lithiby was a painter and designer born in Richmond, Surrey in 1889, the daughter of a barrister. She studied at the Royal Academy Schools and served as a war artist in World War One. On the death of her father set up her studio at Wantage. Source: Suffolk Painters: LITHIBY, Beatrice Ethel (1889 – 1966). Five of her paintings (none from World War One) are available at BBC Your Paintings: Beatrice Ethel Lithiby Lithiby also served in World War Two, in the Auxiliary Territorial Service and was awarded an OBE/MBE in 1944. Next, I moved onto information about Queen Mary’s Army Auxiliary Corps. The Women’s Army Auxiliary Corps (WAAC) was formed following Lieutenant General H M Lawson’s report of 16 January 1917 which recommended employing women in the army in France. Mrs Chalmers Watson became Chief Controller of the new organisation and recruiting began in March 1917, although the Army Council Instruction no 1069 of 1917 which formally established the WAAC was not issued until 7 July 1917. Although it was a uniformed service, there were no military ranks in the WAAC; instead of officers and other ranks, it was made up of ‘officials’ and ‘members’. Officials were divided into ‘controllers’ and ‘administrators’, members were ‘subordinate officials’, ‘forewomen’ and ‘workers’. The WAAC was organised in four sections: Cookery, Mechanical, Clerical and Miscellaneous; nursing services were discharged by the separate Voluntary Aid Detachments, although eventually an auxiliary corps of the Royal Army Medical Corps was set up to provide medical services for the WAAC. In appreciation of its good services, it was announced on 9 April 1918 that the WAAC was to be re-named ‘Queen Mary’s Army Auxiliary Corps’ (QMAAC), with Her Majesty as Commander-in-Chief of the Corps. At its height in November 1918, the strength of the QMAAC was more than 40,000 women, although nearly 10,000 women employed on Royal Flying Corps air stations had transferred to the Women’s Royal Air Force on its formation in April 1918. Approximately, a total of 57,000 women served with the WAAC and QMAAC during the First World War. Demobilisation commenced following the Armistice in November 1918 and on 1 May 1920 the QMAAC ceased to exist, although a small unit remained with the Graves Registrations Commission at St Pol until September 1921. Further information on the WAAC can be found in Arthur Marwick, Women at War, 1914-1918 (London, 1977). The first WAACs moved to France on 31 March 1917. By early 1918, some 6,000 WAACs were there. It was officially renamed the QMAAC in April 1918 but this title was not generally adopted and the WAACs stayed WAACs. The organisation of the WAAC mirrored the military model: their officers (called Controllers and Administrators rather than Commissioned Officers, titles jealously protected) messed separately from the other ranks. The WAAC equivalent of an NCO was a Forewoman, the private a Worker. The women were largely employed on unglamorous tasks on the lines of communication: cooking and catering, storekeeping, clerical work, telephony and administration, printing, motor vehicle maintenance. A large detachment of WAACs worked for the American Expeditionary Force and was an independent body under their own Chief Controller. 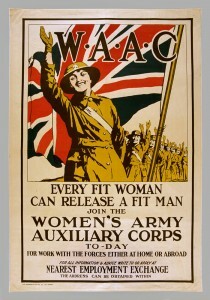 WAAC/QMAAC was formally under the control of the War Office and was a part of the British Army. ‘W.A.A.C. Every Fit Woman Can Release a Fit Man’, 1918 (c). Image courtesy of National Army Museum. 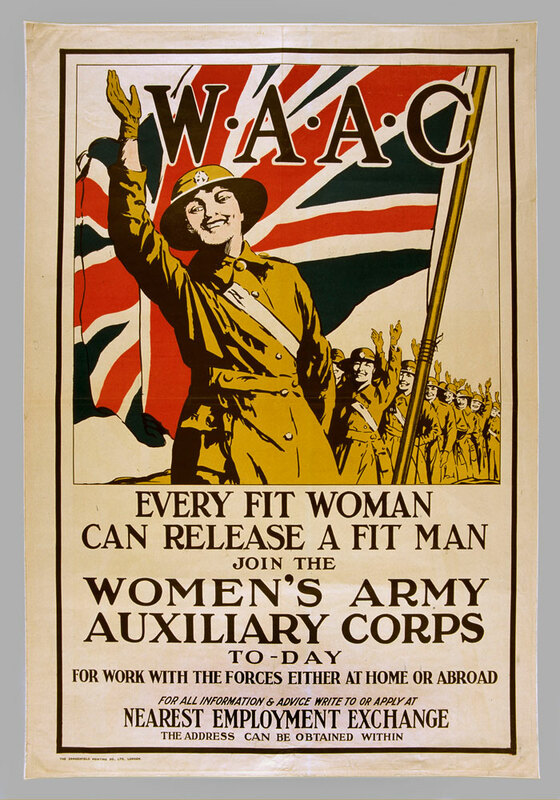 Based on recruitment posters depicting the uniforms of the WAAC and the QMAAC, it would appear that the uniform did not change when the corps name changed – see National Army Museum: ‘W.A.A.C. Every Fit Woman Can Release a Fit Man’, 1918 for an image of the WAAC and Art.IWM PST 13167: Queen Mary’s Army Auxiliary Corps, June 1918 for an image of the QMAAC uniform (thank you, Helen Glew!). Independent of the fact that this artwork does not show the front of the women’s uniforms, this lack of difference in uniform means confirming whether this artwork depicts the WAAC or the QMAAC is challenging. Last and most definitely not least, I moved onto the image itself and was even to trace the details of one of the women depicted, Forewoman (Evelyn) Milnes. Members of QMAAC served with Royal Engineers Signals and Postal Units and this is what this image appears to show. The women are wearing the white and blue signallers armbands and are working as telephone operators. In civilian life up to and including World War One, most telephone operators were female. However, military telephone operators especially those in France, were generally men and Royal Engineers. For example, see the photograph below (which is also used in our header image). Signallers working at the headquarters of R.E.S.S. in France, during World War I. Image courtesy of the National Library of Scotland. The photographic image above entitled “Signallers working at the headquarters of the Royal Engineers Signal Service (RESS) in France during World War I” closely matches the setup and apparatus of this painting. This would suggest that military telephone exchange apparatus did not change significantly during the war, assuming the dates I have attributed are correct. Although undated, I would date the RESS HQ photograph image to c.1916 and assuming the artwork title is correct and this does depict the Queen Mary’s Army Auxiliary Corps then this art can be dated to mid- to late-1918. The close match of apparatus and setup, even down to the lampshades and headsets used, also suggests that the war artist was realistically and faithfully depicting the telephone exchange and indeed may have based it on sketches taken in situ. Later in the war, the gender of military telephone operators began to change and safer locations such as the telephone exchange at Rouen depot began to be operated by female operators. 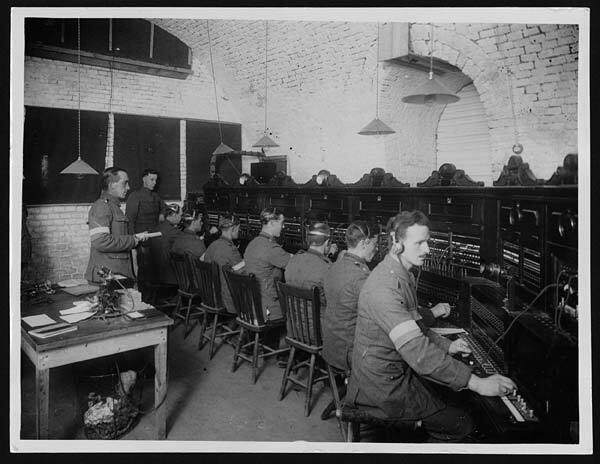 The US Army also used female telephone operators, in particular bilingual operators fluent in English and French, towards the later stages of the war. These were known, as they had been referred to at home, as “hello girls”. The image shows Forewoman Milnes (WAAC/QMAAC equivalent of NCO), the lead female telephone operator (on the right of the image) and Captain Pope (the seated military officer). An additional second male soldier operating a telephone handset is unidentified. According to her military record held by the National Archives, Forewoman Milnes was Evelyn Milnes, born in Sheffield on 24 August 1881 and served in the WAAC and later QMAAC from 1917 to 1920. Evelyn Milnes had five years worth of experience in telephony when she joined the WAAC in 1917 having joined the Post Office as a telephonist in Sheffield in 1912. See Post Office: Staff nomination and appointment, 1831-1969. British Postal Museum and Archive POST 58 reference number 109, accessed via Ancestry.co.uk. Milnes’ appointment is referred to in Minute E23103. Unfortunately, I’ve been unable to find information on Captain Pope (most probably Royal Engineers). The telephone switchboards, or at least the cabinets, appear very similar to those used by the National Telephone Company seen at http://www.allposters.co.uk/-sp/The-Switchboard-of-the-National-Telephone-Company-United-Kingdom-Posters_i1874235_.htm, which is interesting as the NTC was nationalised in 1912 which would make these fairly old, presumably sourced by Royal Signals some years before. Post Office switchboards at this time were less decorative. All in all, it was a wonderful, collaborative day and I look forward to contributing further information to the IWM art collection catalogue. Dr Elizabeth Bruton is postdoctoral researcher for “Innovating in Combat”. See her Academia.edu profile for further details. This entry was posted in Frontline Signalling, Military, Telephone and tagged BPMA, Evelyn Milnes, HistoryPin, IWM, Queen Mary's Army Auxiliary Corps, Royal Engineers, Signallers, telephone, world war one on 20 February 2014 by Elizabeth Bruton. Second Lieutenant Basil Schonland R.E. Image available in the public domain. No Corps of Signals existed in those days. Signalling was very much the province of the Royal Engineers and specifically its Telegraph Battalion and it was they who attempted to use wireless for the first time in a military conflict during the Boer War in South Africa. But it was not equal to the task and it was left to the Royal Navy to show the way. And show it they did during the blockade operation they were mounting in Delagoa Bay, Portuguese East Africa. Wireless proved itself at sea; it was still to do so on land. In 1908 the Royal Engineer Signal Service came into being and it was this body of men, plus their horses, cable carts and much other paraphernalia of war that provided the British Army with its signalling capability during conflict that broke out in 1914. By now wireless equipment suitable for use by soldiers and rugged enough to be hauled about on carts and on the backs of men was slowly becoming part of the Army’s inventory of equipment. And the officers and men were being trained to use it. Amongst that group was a young South African by the name of Basil Schonland. During the summer of 1915 he completed Part 1 of the Mathematical Tripos at Cambridge and immediately set his sights on serving his adopted country. Even whilst a schoolboy, and then an undergraduate in his home town of Grahamstown in South Africa’s Eastern Cape province, Schonland was a loyal subject of the King and, along with many of his fellow South Africans, he saw it as his duty to fight for King and Country. Schonland was commissioned as a second lieutenant in August 1915 and immediately began training at the Signal Depot in Bletchley. In October he was given command of 43 Airline Section with 40 men, their horses and their cable carts and in January 1916 he led them into France where they joined the Fourth Army then being formed under Sir Henry Rawlinson. It was the Battle of the Somme that saw wireless equipment pressed into service in earnest. Though hundreds of miles of telephone and telegraph cables had been laid only those buried at considerable depth had any hope of surviving the onslaught of almost incessant artillery barrages. Visual signalling by flag, heliograph and lamp was perilous in the extreme for the operator who raised himself mere inches above the parapet of a trench: wireless became almost obligatory. And Schonland, whose skills had already been noted, was soon to become a W/T officer in the Cavalry Corps. None was more enthusiastic. 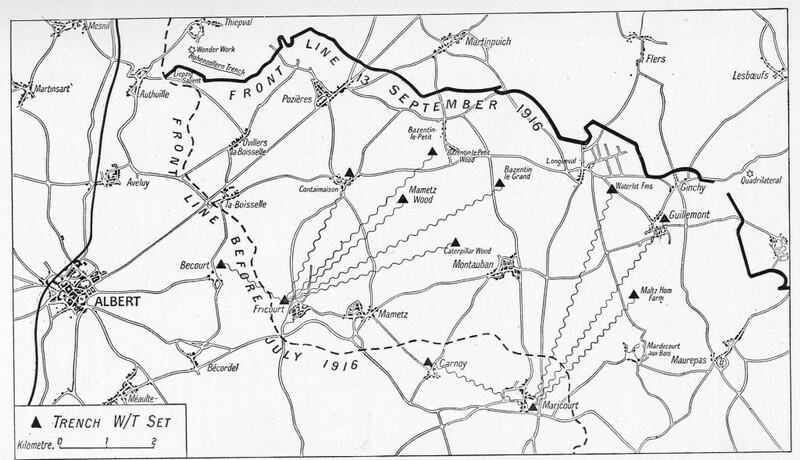 Map showing the deployment of the wireless sets near the front line in September 1916. Image available in the public domain. This new technology caught the imagination of a young man for whom science, and especially physics, was of almost overwhelming interest. He threw himself into mastering the wireless equipment and of passing on his knowledge to his men. The three trench sets with which Schonland became so familiar were the BF Set, the Wilson Set and the Loop Set. The ‘BF’ presumably meant “British Field” but to those who used it in earnest its eponymous letters had another meaning entirely! Like most of the equipment in use at that time the BF set had a spark transmitter and carborundum crystal detector. It radiated signals over a band of frequencies between about 540 and 860 kHz at a power of some 50 watts. The Wilson set was more powerful and used a more sophisticated method of generating its spark. The frequencies (or wavelengths in those days) that it covered were similar to the BF Set. Both were used extensively from within the trenches during First Battle of the Somme in September 1916. In 1917 a new wireless set was introduced. Called the W/T Set Forward Spark 20 Watt B it soon became rather more familiar by the less wordy name of the Loop Set. The loop in question was its peculiar aerial (or antenna) which consisted of a square loop of brass tubing 1m per side that was mounted vertically on a bayonet stuck into ground. The Loop Set’s other great claim to fame was that it was extremely simple to use even for an inexperienced operator. Morse code was the mode of transmission and that skill was fundamental to all who served in the R.E. Signal Service, officers included. Of particular importance, especially to the technically-minded such as Schonland, was the much higher frequency on which the Loop Set worked. It could be tuned to transmit and receive between 3.8 and 4.6 MHz and was claimed to have an effective range of 2000 yards. And though the transmitter still used a spark, the receiver contained two thermionic valves – an astounding technological leap at that time. By then Schonland had left the front line and was instructing at the GHQ Central Wireless School at Montreux where he was also promoted to lieutenant. It was there that he and another South African by the name of Spencer Humby conducted their own ‘researches into wireless’ which they published in a scientific journal soon after the end of the war. “The wavelengths radiated by oscillating valve circuits” became an important paper in the field of wireless communications that flowered in the 1920s. But Schonland was not only a competent physicist; he also wielded an educated pen and his most lasting contribution to wireless communications during WW1 was his four-part series of articles published in 1919 in The Wireless World. They appeared under the title of this article and described the use of wireless in the trenches and were possibly the first such articles to tell how wireless was used during the war by the R.E. Signals Section. The Boy’s Own Paper had nothing on them for verve and excitement! Take this passage in which the young Schonland describes an attack during the battle of Arras in which a key hilltop position had been captured by the British Army. However, the enemy was re-grouping below and a counter-attack was imminent. By the war’s end Basil Schonland had been promoted captain and was in charge of all wireless communications of the British First Army. Under him he had thirty officers and more than 900 hundred men, along with over 300 wireless sets. And soon, after the end of hostilities, strenuous efforts were made to retain his services as Chief Instructor in Wireless in the British Army. But Schonland was intent on following a career as a scientist and he returned to Cambridge to work under Lord Rutherford at the famous Cavendish Laboratory. However he was not lost entirely to the colours for a mere twenty years later he was back in uniform and served throughout the second great conflict with distinction, ultimately as scientific adviser to Field Marshal Montgomery’s 21st Army Group. Dr Brian Austin is a retired engineering academic from the University of Liverpool’s Department of Electrical Engineering and Electronics. Before that he spent some years on the academic staff of his alma mater, the University of the Witwatersrand in Johannesburg, South Africa. He also had a spell, a decade in fact, in industry where he led the team that developed an underground radio system for use in South Africa’s very deep gold mines. He also has a great interest in the history of his subject and especially the military applications of radio and electronics. This has seen him publish a number of articles on topics from the first use of wireless in warfare during the Boer War (1899 – 1902) and South Africa’s wartime radar in WW2, to others dealing with the communications problems during the Battle of Arnhem and, most recently, on wireless in the trenches in WW1. He is also the author of the biography of Sir Basil Schonland, the South African pioneer in the study of lightning, scientific adviser to Field Marshall Mongomery’s 21 Army Group and director of the Atomic Energy Research Establishment at Harwell. Brian Austin lives on the Wirral. This entry was posted in Frontline Signalling, Guest posts, Military, Wireless Telegraph and tagged Brian Austin, Royal Engineers, Signallers, wireless on 7 February 2014 by Elizabeth Bruton. This is a guest post by David Underdown and is a revised and updated version of an article which first appeared in The Ringing World on 19 October 2012, pp1102–1104, 1106–1107. Peal band at Farnham, 25 May 1910, muffled peal of Bob Major to mark the funeral of King Edward VII that day. Russell is in the doorway at the back of the group. A couple of years ago I begin to research the 152 men named on the Surrey Association’s roll of honour for the First World War. Of these, 24 died during the course of the war, the rest survived. 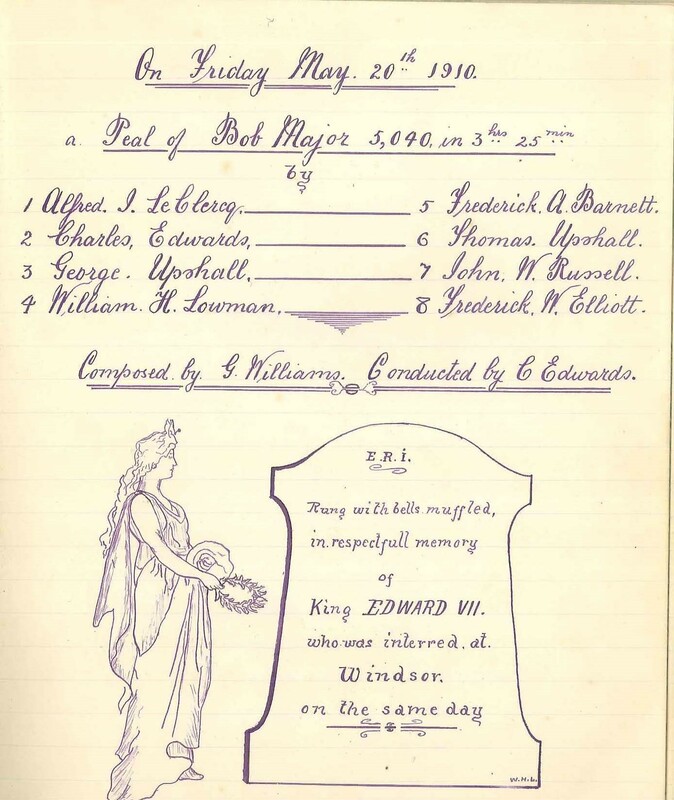 The roll contains the names of a number of high profile ringers, but also many lesser known. A few names continue to defy all attempts to identify them in censuses, army records etc, but I’ve uncovered a number of interesting stories. In terms of his war service, perhaps the most interesting of them is the man who appears on the roll as J Russel of Dorking, but various clues soon led me to realise that he was in fact John William Russell. A simple gardener before the war: he would end it a lieutenant and holding one of the nation’s second highest awards for gallantry, the Distinguished Conduct Medal; two of the third highest decorations, both the Military Cross and the Military Medal; and was also Mentioned in Despatches. He served throughout with the Signal Service of the Royal Engineers. John William Russell was born at Mickleham, Surrey, on 10 August 1887. The family must have moved to Ewhurst quite soon after, by 1891 they were living there, at Coneyhurst Lodge, and the census lists his 2-year-old sister, Catherine Annie as having been born in Ewhurst. His parents were John (28 – a gardener, born Tydd St Mary, Lincs) and Catherine (29, born Elgin, Scotland), John William often appears in ringing records as W Russell, suggesting he may have been known as William, so Catherine Annie may likewise have been known as Annie. He was educated at Ewhurst National School, but by the time of the 1901 census, he was 13 and working as a garden boy. By then the family had grown further, to include Ruth (9), Caroline Jane (7), Charlie (6) and Jessie (5). 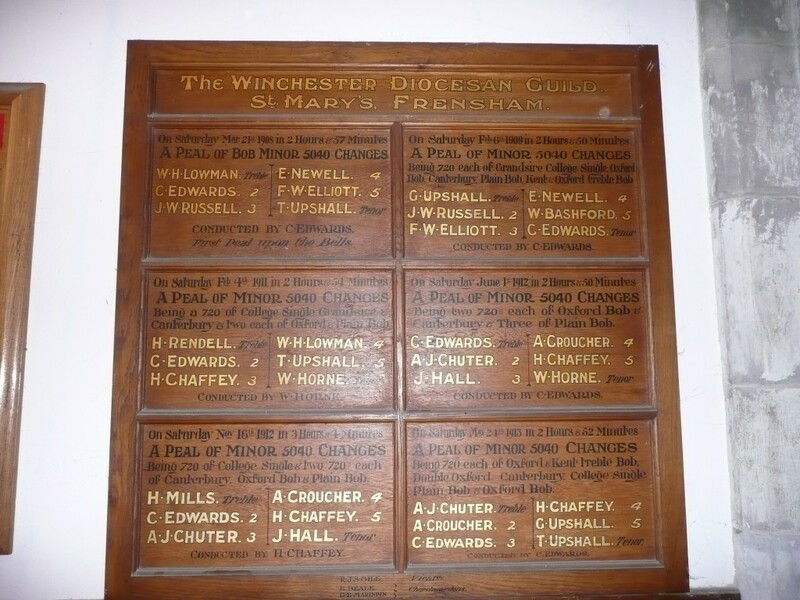 It’s not clear exactly when Russell learned to ring, but he seems to have been elected to the Winchester Diocesan Guild in 1905, first appearing in the 1906 Annual Report as W Russell, Ewhurst, Guildford District. He is listed again as a Ewhurst ringer in 1907. He’s first mentioned in the ringing press in connection with ringing for the visit of the Bishop of Dorking to Ewhurst on 15 December 1907. The next item to appear in Bell News didn’t mention Russell directly, but had considerable influence on his life and ringing. On 18 January 1908 the paper carried an advert by Charles Edwards for two men to work in his plant nursery at Frensham Hill, Surrey. Edwards was a Herefordshire man, but had moved to Surrey in 1905, and seems to have quickly started shaking up ringing in Farnham and the surrounding area. He was also particularly associated with Frensham: the bells there had been augmented to six for Victoria’s Diamond Jubilee, but it was only when ropeguides were fitted around 1907, and he began teaching some of the locals, that it became a strong band. 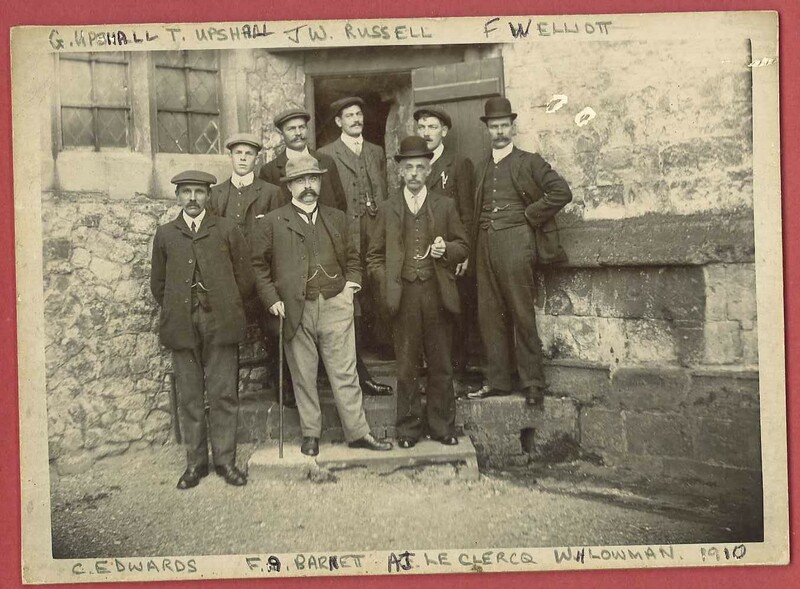 It appears that the first journeyman position was taken by Frederick Walter Elliott (standing to Russell’s left in the photo at the head of the article). He rang a farewell peal at Little Munden, Hertfordshire, on 30 January, with a footnote saying he was moving to Frensham. His later Central Council biography matches this, and gives his occupation as gardener (also confirmed by the 1911 census). Edwards wrote to Bell News to thank those who had applied, and subsequently only the second part of the ad appeared. Russell rang at Frensham at the start of February 1908, and possibly this was also in the nature of a job interview. The ad reveals something of a large hurdle in his obtaining the job though – Edwards was looking for a man of 25-30 and Russell was just 20. However, I initially had trouble finding Russell in the 1911 census as he was listed as being two years older than his actual age, this gives a possible reason for that discrepancy, and it’s also instructive to compare his appearance in the 1910 photo with that of George Upshall, the only one of the men without a moustache, and actually two years Russell’s senior! Russell is first mentioned ringing at Farnham at the beginning of March – though the 1908 WDG Annual Report still lists him as a Ewhurst ringer. He rang his first peal, of Bob Minor, at Frensham on 21 March, the first peal on the bells. The pages of Bell News show a large amount of activity for the rest of 1908: at Farnham and Frensham, and trips to other local towers. 1909 began with another peal at Frensham. This and the previous year’s peal are recorded on a fine peal board at in the tower there. The rest of the year also followed a fairly similar course to 1908: various ringing at Farnham and Frensham, and trips elsewhere in the local district. His recorded ringing in 1909 concludes in October, when it appears he made a visit home, attending practice at Ewhurst on 15 October. 1910 saw a distinct drop in Russell’s recorded activity. In the first half of the year he rang in two half-muffled peals at Farnham, the first, of Grandsire Triples on 19 February, in memory of the well-known ringing cleric theRevd F E Robinson. The second, that of Bob Major on 25 May for the late King, following which the peal band was photographed for posterity. This was noted as being the first peal of major by an entirely local band since 1806, and was accorded a fine entry in the tower peal book. This is his last recorded ringing at Farnham. The Winchester DG Annual Reports for 1910-12 note Russell as a compounding (i.e. non-resident) member, living at Standen, Sussex. On 6 November 1910 he rang a peal for the Sussex County Association at Crawley, having been elected to the association before the start of the peal. The 1911 census (taken at the start of April) shows him as the head of the household, living at Stone Farm Lodge, Standen, with two other gardeners. As mentioned earlier, his age is shown as two years older than his actual age, and since he was the head of the household we can be reasonably sure he completed the form himself – the writing also appears similar to later army forms. Stone Farm was one of three farms purchased by James Samuel Beale in 1890 to form a country estate he named Standen, now a National Trust property. Beale’s wife, Margaret, was a keen gardener. It appears that Russell moved back to Surrey sometime in 1912, probably to work in Abinger. One of the referees on his application for a wartime commission was Lady Mirrielees, who lived at Pasture Wood, Abinger. The membership records of the Ancient Society of College Youths record that John William Russell of Abinger was elected a member in 1912 (http://www.ascy.org.uk/mem1900-1924.htm). He visited old haunts at the end of August, finally scoring a peal at Bentley. On 6 November he rang in a College Youths’ peal of Stedman Triples at Ashtead, Surrey (his first of Stedman); on 19 December he rang a peal of Grandsire Triples at Dorking, this commemorated the laying of the foundation stone for a new chapel. This chapel seems to have proceeded rapidly; on 14 March 1913 there was another peal of Grandsire Triples to celebrate its dedication. This is the last record I have found of Russell as an active ringer, though a letter of his published in The Ringing World during the war suggests he had continued involvement in ringing until going overseas. Russell joined the Royal Engineers at Aldershot on 11 September 1914, just over a month after the outbreak of war. He had been medically examined two days previously, reverting to his correct age, given as 27 years and 1 month. The medical officer described him as being 5’8¼” – relatively tall for the time, having a 36” chest (with 2” expansion) and weighing 156 lbs, with dark hair, a fresh complexion and blue eyes. When signing up, he described himself as a fitter, rather than a gardener, but this seems to have been another attempt to improve his chances, there is no sign in his papers that he was given a trade test, and he was given the rank of pioneer initially, indicating that the army did not view him as a skilled tradesman (who were ranked as sapper). In his subsequent application for a commission, he once more describes himself as a gardener. Official records do not give much information as to Russell’s initial training, however, The Ringing World published regular updates on ringers serving with the forces, and the issue of 9 October 1914, p199, listed “J. W. Russell of Ewhurst, Surrey, Royal Engineers, now at Chatham” – Chatham has been the home of the Royal Engineers for centuries. After his training, he was transferred to 24th Divisional Signal Company (signals had not yet been established as a separate corps, and were an RE responsibility) on 22 October 1914. 24th Division was one of the divisions of Lord Kitchener’s New Army – virtually all the men and officers had to be trained from scratch. The bulk of the infantry battalions making up the division were recruited from the South East and East Anglia, men Russell would have felt at home with. The signal company was divided into four sections, one with divisional HQ, and one each which of the three brigades it comprised. Russell was in the section attached to 72 Infantry Brigade (72IB), the other two brigades were 71 IB and 73 IB. Russell himself seems to have taken full advantage of the opportunities this situation gave to hard-working men: he was appointed lance corporal on 21 November 1914, then promoted second corporal on 10 December, corporal on 6 January 1915 and serjeant on 2 March. Page 143 of the 15 March 1915 issue of Ringing World tells us “J. W. Russell, of Abinger, Surrey, and formerly of Farnham, has had rapid promotion, and has now gained the rank of sergeant.” The division had initially been based along the south coast, principally at Worthing and Shoreham, but in June 1915 they moved to the Aldershot area – familiar territory for Russell. Writing from “somewhere in Belgium,” Sergt. J. W. Russell, Signal Section 721 B [sic – should be 72 IB], formerly of Dorking, and a member of the Winchester Guild, says, in a letter to Mr. F. E. Dawe [presumably Francis Edward Dawe of Woking, a Past Master of the College Youths, and first Hon Sec of the Central Council, and conductor of Russell’s College youths’ peal in 1912], that since he left England on August 31st he has spent a lot of his time in travelling up and down the western front. “My first action,” he continues, “was what is known in the papers as the ‘great advance,’ and since that we have been in a different part of the front altogether. Of course you must understand that we do not spend the whole of our time in the trenches. Personally, I have only spent two whole nights in them during the whole time, although some of my men are in the trenches throughout the period we are ‘up,’ as it is called. I spend more of my time, nights especially, at headquarters, although even there we are often in the danger zone, especially if the enemy gets ‘jumpy ‘ enough to let loose his heavy artillery- then the safest place is a dug-out. “It is difficult to describe the amount of damage done to t he country by heavy gun fire. In some places whole villages are practically levelled to the ground, just a base wall standing here or there, but no semblance of a house, and of course the ground around it is nothing but a series of holes that may be anything from 2ft. to 30ft. in diameter and up to 10ft. in depth. Undoubtedly the enemy’s guns are capable of doing an enormous amount of damage, although I think that now we have just about got their measure in that respect, and can hold our own easily. “How is ringing progressing? I suppose it is as quiet, as ever. One thing I am pretty certain of and that is that a good many of the good bands will never meet again. I am afraid I am getting quite, an outsider now, for I haven’t seen a. ‘Ringing World ‘ since coming out. He had evidently done his job well, as it was in Field Marshal French’s despatch covering this action that he received his first gallantry award, a Mention in Despatches, which appeared in the London Gazette on 1 January 1916. This may have been the reason he was chosen to form part of the King’s guard of honour. The ceremonial inspection took place at Reningelst, Belgium (approximately 5km SSE of Poperinge and 10km WSW of Ieper/Ypres) at 11:30am on 27 October. They had been pulled out of the Loos area on 27 September and sent north to Belgium to refit. 71 Infantry Brigade was replaced by the regular army 17 Infantry Brigade (though of course by this time few of the pre-war regulars remained), and one battalion each of 72 and 73 Infantry Brigades was then exchanged for a regular battalion from 17 IB. He continued in the same vein, receiving the DCM in the King’s Birthday Honours gazetted on 3 June 1916, though the citation was not published until 21 June: “For conspicuous and consistent good work on his system of telephone lines. He has shown tireless energy and resource, besides great gallantry, under fire.” In addition, though he received no further promotions, signallers could obtain increased pay by improving their skill in their designated trade, Russell’s record shows he was rated “proficient” on 20 September 1915, “skilled” on 20 March 1916 (and would ultimately be rated “superior” on 20 September 1916). The division had spent this entire period in Belgium, much of it around the Ypres Salient. Though there were no major battles, there was constant shellfire, and some fairly serious poison gas attacks by the Germans. Telephone and other communication cables were frequently broken and had to be repaired quickly, even if the shelling hadn’t stopped. In mid-July the division returned to France, ordered to the Somme to relieve the units which had begun the battle there on 1 July. They fought in the Battle of Delville Wood, and the last German forces there fell back on 3 September after a long fight, and 72 IB was involved to the very end. The Division then took part in the subsequent Battle of Guillemont which helped to stabilise the British hold on the area. Russell was hospitalised from 23 February-6 March 1917, no reason is given in his records – the company war diary shows 13 men were admitted to hospital in February 1917, and four were still there at the end of the month; most of the month was spent in training, so it is unlikely it had anything to do with enemy action. After returning to his unit, Russell was granted home leave from 16-26 March – this was presumably the first time he had seen his wife in 18 months. By now, planning was well under way for another major offensive in the Arras area. The task of taking the strategically important Vimy Ridge had been allocated to the Canadian Corps who had been training for months, and under the ground was a maze of tunnels. The attack was due to be launched on Easter Day, 8 April 1917, but in the event was delayed by a day at the request of the French, who were to launch another attack further south, one purpose of the British attack being to draw in German reinforcements and thus weaken the defences in the area the French were to attack. On 9 April, 24 Division was holding the trenches from which the Canadians launched their attack, and so suffered badly in the German counter-bombardment. The initial few days of the offensive were a great success, but momentum gradually slowed. By 13 April the division was slightly further north, almost on the same ground as they had fought over at Loos on their first arrival in France. At 2.55pm on 13 April, Divisional HQ signalled to 72 Infantry Brigade that the Germans seemed to be making a full-scale withdrawal. Over the next few days, the division moved forward to take over the old German trenches. It was probably for actions at Arras that Russell recommended for the Military Medal, which was gazetted on 21 July. No citations were published for these awards, and unfortunately the company war diary never mentions any of Russell’s awards while he was a serjeant, though some awards to other men are mentioned, so it’s impossible to be sure, but the rule of thumb among WWI researchers is that medals followed around three months after the action concerned. By then the division was back in Belgium and had fought in the Battle of Messines from 7-14 June, preparations for this action had begun over a year earlier with major mining operations, the attack opened with one of the largest non-nuclear explosions in history, when explosives packed into the tunnels were set off immediately under the German frontlines. Early in July, Russell’s company commander recommended him for a commission. Russell was interviewed by the Deputy Director of Signals, Second Army (a full colonel) on 10 July, who approved the application. On 31 July the Third Battle of Ypres began (better known by the name of one of its sub-phases, Passchendaele). The division was involved in the Battle of Pilkem from 31 July to 2 August, and then the Battle of Langemarck from 16 to 18 August. Inevitably there was a fair amount of paperwork to sort out before the commission became official. Applicants were also expected to give two character references, in this case Lady M Mirrielees of Pasture Wood, Dorking (the family also owned Goddard’s at Abinger Common) and the Revd A E Clark-Kennedy, the Vicar of Ewhurst. 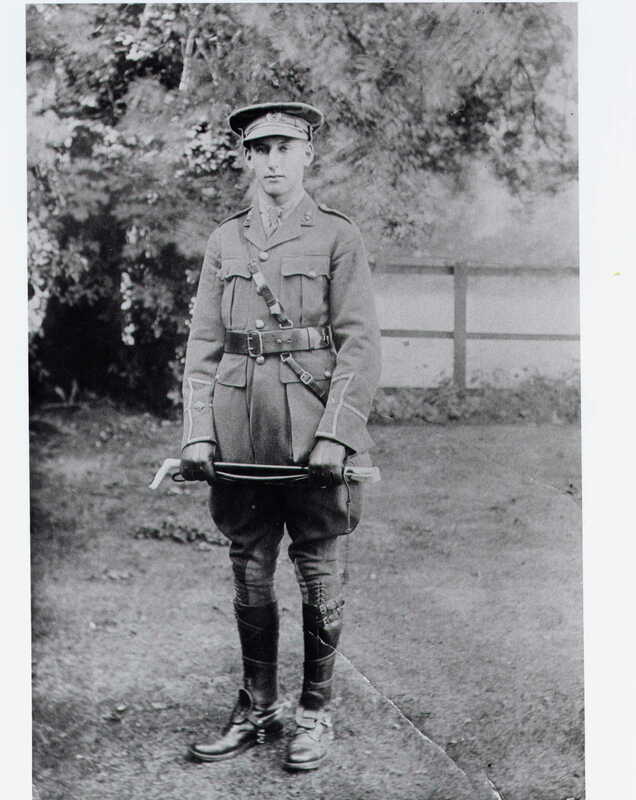 Formalities complete, he was commissioned as a temporary second lieutenant on 2 September 1917, continuing to serve with 24th Divisional Signal Company. The division’s final major action of the year was at the end of November, defending against German counter-attacks in the Battle of Cambrai. 24 Division played a heroic part in the defence, particularly in and around the town of Le Verguier (about 20km west of Péronne) on the opening day of the German offensive, 21 March, here there is a street named after the division, Rue de la 24éme division Britannique. Even more unusually, the division is named on the town’s own war memorial. That was the German’s last attempt to win the war, begun in the knowledge that US forces were building up in earnest, and that they had to try and strike a decisive blow before the strategic advantage changed hands. Soon the momentum was with the Allies who begin a steady advance during the “100 days” which finished the war with the coming into effect of the Armistice at 11:00am on 11 November 1918. This did not bring Russell’s service to an immediate close, as 24th Division formed part of the Army of Occupation which was sent into Germany and remained there until the end of May 1919. Even then, Russell continued to serve at home, perhaps he actually considered taking a permanent commission, but it seems that ultimately he either found peacetime soldiering dull, or there simply wasn’t the requirement for a ranker officer in the reduced army. On 12 May 1922 he relinquished his commission. His discharge documents show he gave his permanent address as Coneyhurst, and despite calling himself a “fitter” when he originally joined up, here he states his occupation as “Landscape Gardener”. His final posting had been with a signals unit of Southern Command at Portsmouth, he remained a Royal Engineer, but was attached to the brand new Royal Corps of Signals on its formation. Another possible reason for his deciding to leave the army was the birth of a daughter, Olive Betty, whose birth was registered in Portsmouth in the third quarter of 1921. Russell’s contact with the War Office had not quite ended. He was entitled to a war gratuity for the period he served in the ranks, but owing to his late demobilisation, and confusion with another J W Russell he had to fight to receive it, the Royal British Legion having to step in on his behalf. The correspondence in his service file relating to this shows that by 1923 he was living in Ringwood, Hampshire. It appears his wife died in late 1926, aged just 41, in the Bournemouth area. I have not been able to much information about his life in Hampshire: he does not re-appear in the membership lists of the Winchester DG prior to the Second World War, so he probably did not return to ringing at this time. Local directories from 1930, 1934 and 1945 give his address as Grange Estate, St Leonard’s (the first of this actually states Mrs J W Russell, presumably a typo). Local ringing records do show a J Russell ringing the tenor to a touch of Stedman Doubles on 19 March 1946. It seems likely this is the same man, but there is no definite proof. Russell died, sadly, on Christmas Day 1946, aged 59. The causes of death are given as (a) cerebral embolism and (b) mitral disease [of the heart]. Olive was present at the death, which took place at Grange Estate, St Leonard’s and St Ives Rural District (near Ringwood). His occupation is recorded as “Contractors’ Foreman (Engineer)”. He was buried at Ringwood Cemetery on 28 December 1946 in grave D/D 249. The burial records describe him as “Clerk of Works, retired”. Probate was granted in London on 4 June 1947, to his executor, Douglas George Oliver, a market gardener. He left an estate of £990 6s 6d (equivalent to around £134,000 today, as a share of GDP). His will, drawn up in 1938 makes prominent mention of Daisy Elizabeth Dymott, given her choice of ornaments and furniture, a joint share of the house with Olive (unless they decide to sell it, in which case Olive would get all the proceeds), and to act as Olive’s guardian had Olive still been under-age. Daisy appears never to have married, also born in 1881, the 1911 census records her living with her parents in Southampton and employed as a geological examiner. She probably simply helped to look after Olive after Rosetta’s early death. Olive seems to have married Ernest C White (a civil servant) in 1953 and lived in Wimborne Minster until her own death in 1960 aged just 39, even younger than her mother. A Rosemary A White, with a mother’s maiden name of Russell, was born in the Poole registration district (which then included Wimborne) in 1957. The four gallantry awards he received make him comfortably the most decorated member of the Surrey Association to have served during the First World War. He may well be the most decorated ringer of the war – one ringer, Serjeant William Johnson of Worksop Priory, is known to have been awarded the Victoria Cross, and a few others received the DCM or MM and Lt-Col Charles Frederick Jerram, Royal Marines Light Infantry was Mentioned in Despatches five times, awarded the DSO and appointed CMG (and awarded the French Croix de Guerre), largely for staff work, but I have not seen any other with so many gallantry decorations. I was able to photograph Russell’s service record, the images can be seen at http://flic.kr/s/aHsjuG8kwe. I am grateful to the librarians of the Winchester DG and Sussex County Association, Bruce Purvis and Stella Bianco, for checking annual reports; Alan Baldock the Sussex peal secretary for details of Russell’s one peal in Sussex; Paul Whewell and David Munro of Farnham and Frensham respectively (and the other ringers there) for providing photos of peal records, and the photo of the man himself; and Christine Wright of Ringwood for information from local directories, tower records, and the burial records. Apologies if I have omitted anyone who provided me with information. This entry was posted in Guest posts, Military and tagged bell ringing, Dorking, First World War, Royal Engineers, world war one on 22 January 2014 by Elizabeth Bruton.